The 17th century philosopher Baruch Spinoza counseled that we strip ourselves of our attachment to our personal identity and instead use reason to take our place as citizens of the cosmos. Contemporary philosopher and novelist Rebecca Goldstein betrays Spinoza in her book Betraying Spinoza by considering how the environment he grew up in influenced his philosophical views. She also betrays Spinoza by telling something about the unusual circumstances in which she first encountered him. I will also betray Spinoza. To begin with, my knowledge of his work is secondhand. Yet it has affected me profoundly. The loss of individual identity, of subjectivity, advocated by Spinoza leads to what Goldstein calls radical objectivity. This objectivity is different from what, rightly or wrongly, is today taken to be the objectivity of science. Spinoza’s worldview is framed by reason, yet there is a strong ecstatic, or blissful, impulse it. (In fact the word ecstasy originally meant to stand outside oneself.) Goldstein sometimes pegs his views as ecstatic rationalism. Although Spinoza suggests the key to avoiding suffering is to enlarge one's frame of reference to include all of creation, his views are grounded in bodily experience and in subjectivity. He wrote, “The endeavour, wherewith everything endeavours to persist in its own being, is nothing else but the actual essence of the thing in question.” ( The Ethics , Part III. VII, quoted in Goldstein p. 161) We come into being in a body and are committed to the well-being of this body in a way we are committed to nothing else. We cannot help it. I had an illuminating experience while reading Goldstein’s book. Just as I was getting ready to go to the airport for my flight home from a trip, I checked my email and received some unanticipated bad news. A deeply unpleasant incident occurred on the way to the airport as well, in part because I was completely occupied processing my thoughts and feelings. I arrived at the airport in a state of psychic shock. After stewing in my feelings for a while more, I felt drawn to reading Goldstein’s book; I read straight through to Boston. When I arrived home, my emotional pain had not gone away: it was a deep ache in my chest. Yet I was now able to accept these unpleasant events and the internal discomfort they caused without judgment. This seemed to free my mind from its tendency to process seemingly endlessly deeply upsetting events. Spinoza’s pragmatic if challenging solution to the question of human suffering meets another strand of his philosophy. His basic assumption is one of holism. He begins The Ethics with the following definition,“By that which is self-caused, I mean that of which the essence involves existence, or that of which the nature is only conceivable as existent." (The Ethics, Part I, I, in Goldstein p.71) The universe causes itself. It is therefore deterministic, even if we with limited minds can not understand it. The universe defines logic, or as Goldstein says, it is logic self-aware. But this reality is not the material world generally perceived by the senses. Sense experience is the lowest step on Spinoza’s hieracrchy of cognition; he calls it imagination. Rather reality is the web of rational necessary connections that underlie the cosmos. By forsaking personal identity, and using our reason, we can partake of this web of necessary connections of which we are, at least in our essence, inherently a part. Though this logic is something we can only fully experience with intuition, our reason prepares us and guides us to this knowledge of God with Nature---deus sive natura. I had another experience that helped illuminate the power of Spinoza’s work. One morning after spending about an hour with my notes from Goldstein's book in preparation for writing this article, I went outside to go to my car. The shimmering light and my hour with Spinoza seemingly came together to allow me a taste of something extraordinary, which might have some relationship to the ecstacy associated with nature for Spinoza. This feeling came neither from the sensory details themselves, nor how they fit together. Rather it came from something intangible behind all this. Whatever it was seemed dazzlingly intelligent (though whether it was was rational, and thus conceptual, or non-conceptual, I do not know). In any case, the world appeared both material and immaterial, and I found myself soaring to the rhythm of the pulse between the two. For the next several hours, whenever I turned from my work I could reconnect to this ecstatic feeling. (Even now when I extend my field of vision to its limits, I can recapture a faint echo of the feeling.) But later in the afternoon I came down hard. A friend’s manipulation about something unimportant and my acquiescence in order to minimize the situation and avoid a showdown left me internally fuming. My effort to talk myself down and to distract worked only to an extent. It did not really get inside to the source of my intense reaction, and I could not completely put this reaction aside. Alas, even though I had tried not to betray Spinoza and myself, I ended up betraying us both. I plan to read Spinoza’s books, even though their sparseness and rigor makes them daunting. I would like to get a more of a feeling for this web of necessary connections Spinoza calls reason and also how reason and intuition come together for him. Even more importantly, I hope his methodology---his bare bones rationality---in conjunction with his message, will help me become more immune to the seductive and tenacious pull of negative emotions (even when it is round about). Although I tend not to think this way, I am aware that there may be a bonus. Actually my preference is for super-grounded experiences of altered consciousness rather than ecstatic ones. But hey, if it ever gets to be a real issue, maybe I can work something out. Rebecca Goldstein, Betryaing Spinoza: The Renegade Jew who Gave Us Modernity (New York: Schocken Books, 2006). 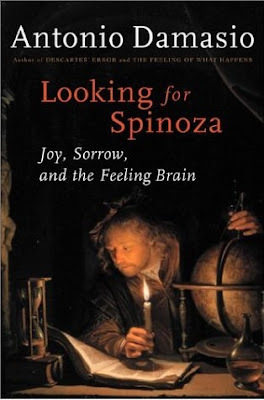 Antonio Damasio, Looking for Spinoza: Joy, Sorrow, and the Feeling Brain (New York: Harcourt, 2003). I originally published this on my own personal blog. I had transferred some of these comments. I'd say you should indeed continue to betray Spinoza and search the depths of that sensation which seems to have been so exhilarating. This is the first time I come across your blog, but it will be worth to continue reading. May you consider in your further reading of Spinoza the fact that us, as humans are now walking a path on becoming multi sensorial beings. Which may well enhance our congnitive capacity to in-depth intuition, as you best state it. Best regars, I look forward to continue reading. Thank you for asking me to think about Spinoza, whom I loved when I ready the Ethics long, long ago. I think of him as very much a philosopher's philosopher, and have wondered about the recent revival of interest in him, especially in Jewish quarters. I rather think it has to do with the world-wide revival of religiosity and religious extremism. 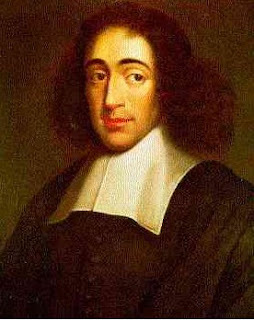 Spinoza offers something else, that, as you clearly indicate, provides some of the emotional satisfaction of religion without a radical sacrifice of reason. I do like Spinoza's rationalism, although it is hard to put into practice. I understood his 'conatus' to be a sort of impetus or striving for life, something like that is also described by Schopenhauer, but more as a passion. Spinoza describes it simply as a kind of self-preservative appetite implicit in the very possibility of individuality - not at all the self-absorbed 'me-first' kind of modern preoccupation that I suspect Goldstein describes and that you were struggling with on that ugly day. Sometimes it seems to me to be close to an 'elan vital', but most importantly, if you follow out the ethical implications, it means that aggrandizing the self to include more than the survival of this little mind and body, but all that is understood and cared for, then you can put up with the small affronts and failures more easily. Not a bad philosophy to hold when so many things are interconnected and so much at risk. The alternative is to curl up into a tight little ball of ferocious resentment, and that is also very widespread. I admire you for thinking through the things you do and books you read so carefully. You read all the books I think I ought to read, but don't get around to. I am glad you wrote this piece on Spinoza. There is so much coming out on him, and I feel as if I am missing all these events and publications for various reasons. Somehow, this idea of going beyond identity seems so Buddhist to me. Also the state you describe near the end of the article sounds like one of the Buddhist Jhanas or Absorptions. I am off to the Barre Center for Buddhist Studies for 10 days to study the jhanas. I will know more, hopefully when I return on April 23. Aldous Huxley addressed the topic of "holy resignation" in his book on comparative religion, The Perennial Philosophy. Catholic theologians speak of it in terms of the disturbance (or more specifically here, otherwise), of one's "interior economy". I believe, rather, that holy resignation depends not on "standing outside oneself", so much as "dying to oneself" a little more each day, very much aided by a strong faith/awareness of Divine Providence. Religious faith and knowledge form a continuum, as that continuum forms another metacontinuum with our secular faith/knowledge continuum; turning on the light switch and expecting the light in the room to come on. It just occurred to me that that also requires one of the other two so-called "theological virtues; Hope! As for Charity, the closest to that that can be adduced here, I expect, is that one has to be alive and "looking forward". In short, it is a matter of dying to ourselves in this life, to find our true selves, partially, while still here on earth. The locus of the pain has to be filled with a usurping, positive replacement, and that means making room for such inspiration. In some situations there are "tricks" for coping with emotional pain. If you know someone has been speaking ill of you, perhaps wrongly, ask yourself how many times you may have done the same. Another device is - mindful of God's Providence, which is never derailed, whatever the appearances - accepting the particular trial as a direct gift of God, and "offering it up", as Catholics put it. All very moribundiferous!